Primers for preparing walls; paste, powder and liquid adhesives for all types of wall coverings. Glue and mastics, sealants, silicones and acrylic sheaths, super light plaster. Adhesives for wood floors, carpets and linoleum, for sports and vinyl floors. 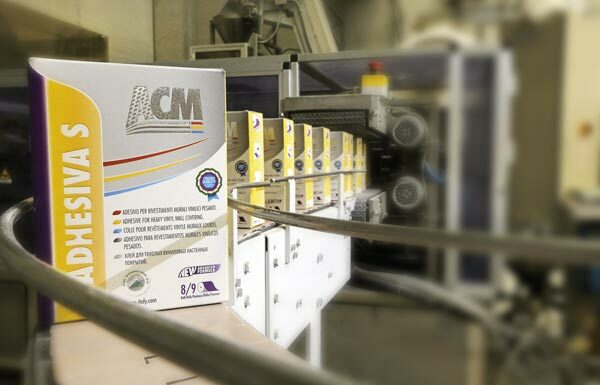 Since 1973 ACM manufactures adhesives, glues and mastics for the building sector. The long experience and the high professionalism have made this company a reliable partner for the professionals of building construction. ACM has always dedicated its research to create innovative products able to satisfy the diverse needs of every customer. Nowadays ACM is a steady presence in more than 30 countries all over the world, thanks to its full and specialised products range. Its quality outstanding products are also totally solvent free and have low VOC emission. The merit of all this is yours, your requests, your advice and the daily work we do together. For over 30 years, those who work in construction know that they can rely on a reliable partner.